On Dec. 9, from Madison Square Garden Theater in New York, reigning WBO junior lightweight champion Vasyl Lomachenko will square off with WBA junior featherweight champion Guillermo Rigondeaux on ESPN. The showdown is a matchup that has been long awaited by many in the sport. After capturing gold medals in 2000 and 2004, Rigondeaux fled his native Cuba in 2007 before eventually turning professional a few years later in May of 2009 in Miami, Fl. The buzz on Rigondeaux was through the roof, yet at age 28 at that time, he needed to be put on a fast track if he was to crash through the championship ranks. Rigondeaux did just that, and his talent was eye-catching, as he registered stoppage victories in five of his first sixth bouts. Within his first two years as a professional, Rigondeaux was able to capture the WBA interim junior featherweight title, and later became full WBA champion when he knocked out an overmatched Rico Ramos in the sixth round inside of the Pearl Theatre inside of the Palms Casino and Resort in Las Vegas in his ninth professional bout. Perhaps Rigondeaux’s biggest victory to date came in April of 2013 inside of the Radio City Music Hall in New York, as he defeated five-division world champion Nonito Donaire over twelve rounds on HBO. It was this performance, in which he was a clear underdog coming in, that Rigondeaux was able to stamp himself as a world-class prizefighter. And, while Rigondeaux still stands undefeated at 17-0 with 11 knockouts, he has truly failed to create a buzz for himself over the past few years due to inactivity, and failing to capture the public’s attention due to a style that is heavily refined from a boxing standpoint. 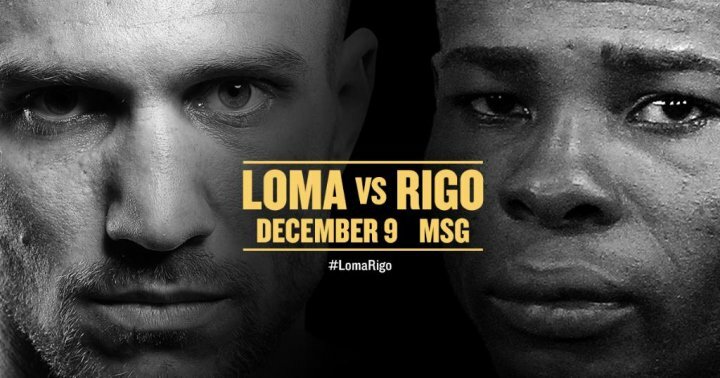 On Dec. 9, Rigondeaux could change the perception of many. It’s safe to say that fighters like Vasyl Lomachenko are very rare in the sport. A two-time gold medallist himself, winning in 2008 and 2012, Lomachenko is considered one of the most accomplished amateurs of all time. Big things were expected for him when it was announced that he had opted to sign with Top Rank as his promoter, and he hasn’t disappointed. The only blemish in Lomachenko’s career is his second professional bout, where he lost a split-decision to battle tested Orlando Salido in San Antonio, Tex. Since that match, Lomachenko has undoubtedly stamped himself as one of the top fighters in the sport. Combining an excellent blend of speed, power, elusiveness, and great boxing ability, Lomachenko is nicknamed “The Matrix” for a reason. He is a on a great roll as a professional, and has captured victories over champions/former champions such as Gary Russell Jr., Roman “Rocky” Martinez, Nicholas Walters, and Jason Sosa. He is a betting favourite over Rigondeaux and much will be on the line for him next month. Lomachenko is 9-1 with 7 KO’s. This is certainly a matchup worth analysing, but the more you look at this fight, it’s hard not to favour Lomachenko. He has advantages in age (he is 29 to Rigondeaux’s 37) as well as size, as the Cuban champion will be moving up two full weight divisions, from junior featherweight (122 pounds) to junior lightweight (130 pounds), specifically for this bout. But, if you look at things even closer, you will see that Lomachenko has not only been the busier fighter the past few years, but against a higher level of competition. Logic says Lomachenko will find a way to keep the momentum rolling and score a victory on Dec. 9. Will David Lemieux’s Hometown Advantage Give him the Edge Over Billy Joe Saunders?